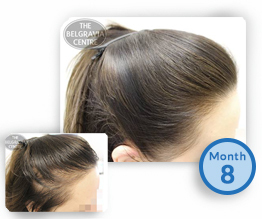 Within every Belgravia female hair loss treatment course there are a number of components that contribute to the optimum hair loss treatment course to suit the individual’s particular hair loss stage and condition. This page explains each of these components, what they contain and how they work to prevent female hair loss and regrow hair. Treatment users can visit the centre in London or alternatively receive a home-use treatment programme anywhere in the world. A Belgravia female hair loss treatment course deals with as many ways as possible to counteract every element that causes women’s hair loss. When you visit Belgravia or complete our online consultation form, the specialist dealing with your case will recommend the most suitable and effective treatment course components for your particular condition based on factors including your hair loss condition, pattern and stage of shedding and your medical profile. There are enzymes in men and women who are genetically predisposed to pattern hair loss (called 5-alpha reductase), that turn the hormone ‘testosterone’ into another hormone derivative, ‘dihydrotestosterone’ (DHT). When DHT is formed, it attaches itself to the hair follicles on the top of the head, causing them to continually shrink with every growth cycle. This causes gradually thinning hair which becomes increasingly weaker until the follicles finally become dysfunctional and the hair no longer grows. Hair loss in women is also frequently caused by lack of intake of certain nutrients, amongst other physical and psychological factors such as hormonal problems or stress. Minoxidil was the first medical hair loss treatment to be proven to reverse male pattern baldness and female hair loss and to be medically licensed by the MHRA in the UK and ‘FDA Approved‘ in the USA. Minoxidil increases the blood supply to the area that it is applied which increases the nutrients delivered to the hair follicles and prevents shrinkage of the follicles, resulting in prevention of female hair loss and regrowth of the hair in most cases. Minoxidil acts by opening up potassium channels, which has been found to prevent male and female hair loss. Unfortunately there is no treatment clinically proven to prevent the formation of DHT in women but Medroxyprogesterone (MPG) or Azelaic Acid (AA) may help to prevent DHT and can be found in some minoxidil products. 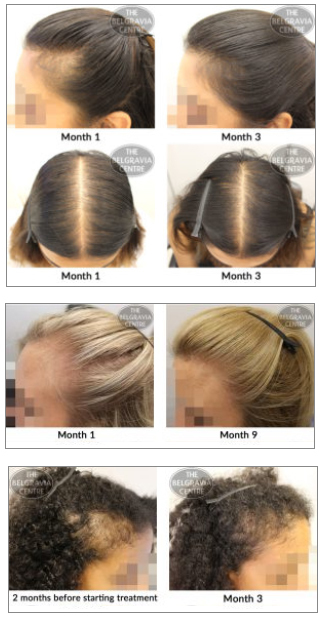 Belgravia’s exclusive food supplement, Hair Vitalics for Women (described in more detail below), contains ingredients which may also help to inhibit the formation of DHT. For more information on the range of high strength minoxidil products available from Belgravia’s Pharmacies, or to ask a question or arrange a free hairloss consultation, please contact the centre. The HairMax LaserBand and LaserComb devices are low-power laser devices that are FDA-cleared to treat hair loss and have been designed especially for use on the scalp. These home-use devices are intended to promote stabilisation of hair loss and encourage regrowth. 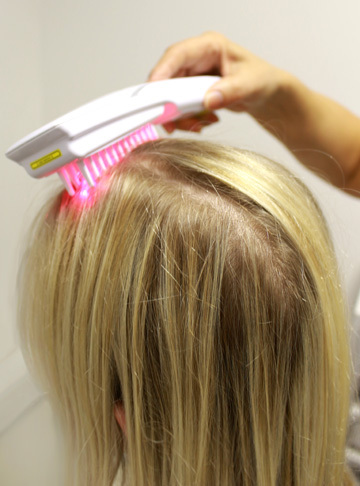 The LaserComb can help to promote hair loss stabilisation and regrowth and is particularly beneficial when used as part of a combination treatment course consisting of the primary medications for hair loss. Hair Vitalics for Women is a one-a-day food supplement which contains a number of highly-targeted vitamins, minerals, amino acids and botanicals required to make sure the blood being delivered to the follicles contains the nutrients needed for healthy hair growth. Some of the key nutrients included in Hair Vitalics for Women are selenium, biotin and zinc which help to maintain normal hair growth function, copper which helps to maintain the hair’s pigmentation, and the soy isoflavones genistein and daidzein – plant-derived phytoestrogens – which research has shown may reduce DHT in the blood. Clinical treatment therapy can be included in a scalp problem or hair loss treatment course on a fortnightly, monthly or quarterly basis. It involves visiting the clinic and takes about 1 hour. Treatment involves steam, scalp treatment, ultra violet and infra red light therapy, laser and massage. The purpose of clinical treatment for female hair loss is to help maintain the condition of the hair and scalp and stimulate activity in order to further encourage hair growth. Belgravia’s specially formulated shampoos and conditioners are designed for every hair type. They will not contribute towards hair loss stabilisation or regrowth but will help to maintain one’s hair and scalp in a healthy and vibrant state. Check-ups are available to patients at their own convenience. Quarterly check-ups are advised but if a patient has any question or requires a visit they are always welcome. For those on a home use treatment course, one of our hair specialists will be more than happy to discuss any queries over the phone or via email. It is very important when using prescription medications that this hair loss treatment is monitored and, if you have any queries with regards any aspect of your condition or treatment during your treatment period these should be addressed and answered in as short a time as possible. This is what Belgravia’s hair loss specialists are here for.